Our experts combine disciplinary, regional and policy focus to help understand the region and the challenges and opportunities that exist. If you want to take your career to the next level, or you’re interested in moving in a new direction, our postgraduate degrees will equip you with the skills, knowledge and expertise required to get you noticed in your field. At our Postgraduate Information Evening you will meet representatives from four prestigious schools: Crawford School of Public Policy, Coral Bell School of Asia Pacific Affairs, School of Regulation and Global Governance and School of Culture, History and Language. Program convenors Learn about study pathways and receive personalised advice based on your career goals and academic interests. 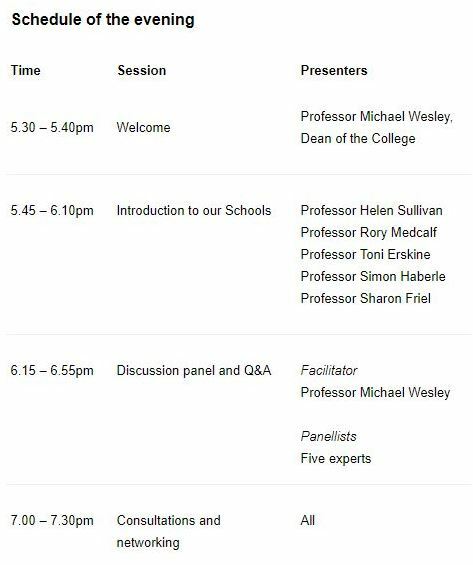 Top academics Hear insights on the region from world-renowned experts including the Dean and School Directors. Students and alumni Discover personal perspectives about courses, scholarships, study aboard and career opportunities. Program coordinators Understand admission requirements and learn how you can receive credit for past study and experience.